This breathtaking piece was completed by Greg in September 2013. 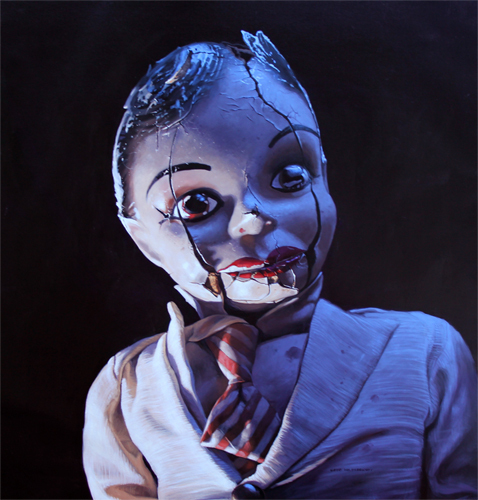 Stunning and dark, this puppet is a favorite of Greg's. For years he tried to find the time to start a series of paintings that are of his collectibles, and now he has! "Said the Spider to the Fly" was the first place winner in the category of still life for the 2014/2015 Art Renewal Center's Annual Salon Competition. Greg was honored to have this piece on display in the MEAM Museum in Barcelona, Spain, and the Salmagundi Club in New York City. This painting was the first among Greg's puppets in his "Kid Stuff" series, and it represents a great affection for the many toys he has collected throughout his lifetime, no matter how aged and unloved they were. Every crack adds character, every scratch has a story, and every toy is cherished by Greg. Giclée reproductions are created by tiny jets spraying millions of droplets of oil-based printing ink onto a sheet of fine art paper. This spray of ink, more that 4 million droplets per second, whirls onto paper spinning on a drum at 250 inches per second. Hence the name giclée, French for "fine spray." As with all of our products, lay-a-way plans are always available. 24" wide and 24" tall.